Regardless of the camera we use, light is still everything. The camera that most of us will have most of the time is the one attached to our phone and on the basis that the best camera we can have is the one that we have got on us, then maybe more should be made of the opportunities that this presents. This post, being the first of 2019, will be set around making the most of our camera phones, an easy to keep New Year’s Resolution, not necessarily as a primary, go to, choice of camera, but on the basis that it is the most portable and the most accessible. Few of us feel properly dressed if we leave the house without our phones, but that’s another problem. The camera’s on modern phones are really quite remarkable in their capacities to capture decent images. Things that mitigate against them tend to be form factor – what they feel like in the hand – dynamic range – the amount of light that can hold detail between the very brightest to the very darkest part of the image – and a lack of optical zoom, for the most part. Note that the word megapixels doesn’t appear in this short list. My cheap and cheerful phone, bought in 2017, has a 12MP rear facing camera, the same as the original Canon 5D. Top end phones are now boasting 20MP plus cameras. Megapixels are rarely a problem these days. That said a camera phone makes for a lousy sports camera and when on safari and photographing prides of lions the distance we would need to keep to fill the frame would be well beyond wreckless. Similarly a 20 by 30 foot poster at 300 dpi is going to look pixelated (from most cameras it has to be said) but then you wouldn’t print that big at that resolution. Everything that we did in our 101 Corner series can be done, effectively, on a camera phone (Links to: Part 1, Part 2, Part 3, Part 4, Part 5, Part 6, Part 7, Part 8, Part 9, Part 10) and we need to see our camera phones as our primary practice camera, if not our primary camera (as some professionals do) the one we can use over a luch break or someother gap in the day – it doesn’t have to be a long one, most of the things we will talk about can be done in ten minutes as effectively as sixty. Sometimes more so as we are forced to do rather than ponder. So we need to make an ally of our camera phones convenience and we need to make the most of its features and take account of rather than make an issue of its limitations. All camera set ups have limitiations. Without exception. Doing something about it delineates the photographer from the person with a camera. The first thing to note is that most of us will be shooting with a fixed focal length lens, usually around 27mm equivalent on a full frame camera, 18mm on an APS-C. This means wide angle shots which means filling the frame means getting close to small and people sized subjects. Use your feet to zoom not the digital zoom on the camera – it rapidly degrades the image quality. It also means that we need to pay more heed to having something in the foreground to skirt the problem of having unproductive negative space that diminishes the impact of our main subject. We could also use leading lines and/or forced perspective, or moving to reframe to combat this. Remember the object is to fill the frame with our subject. Zooming aside, there isn’t a lot that we can’t do with the right app (I will come to lighting presently). If the native camera app on our phone is limited then there are plenty of others available. The one I use (Android) is Open Camera that gives a lot of control (DRO, HDR, Manual, Exposure Compensation, Differential Focusing, Noise Reduction, Burst Mode, RAW etc). Apple has a very good native app but generally lacks manual controls. There are plenty of other apps available such as ProCamera (widely recommended), VSCO, Camera+ 2. As with all these things, it comes down to personal preference regardless of operating system. There is also the question of an editor. Now there is a big difference between slapping a filter over a mediocre image and editing for the best effect. As a development tool the object is to get things as right as possible in camera and then edit as necessary. As for apps we can do worse than Snapseed, but again there are plenty to choose from and it is personal preference that matters. Lighting, bearing in mind we are making the most of what we have, or can be very cheaply obtained, really should remain natural. The single LED is fine up to about arms length (and that is being very optimistic), may be synched as a flash, but will be very slow. For slow read useless in most situations. It can be OK in macro but even that can be fiddly. Stick to natural light, though you can get a ring LED light for about a tenner (AKA a selfie light, which tells you what you need to know), are you going to carry it with you everywhere? And this, more than anything else, is about looking for those opportunities everyday life gifts us, using the best camera we have, being the one we have at that time. It is about sharpening our skills, its about injecting some fun into parts of the day. It can also be about trying something new, say like street photography (if you want to be incognito plug in your headphones and use the mic switch to activate the shutter) , or a project as we discussed in the last post. It is the New Year, time for resolutions, make one that’s fun and easy to keep. Editing this week. Not it in your ed, you understand, but giving 8 images to 30 ‘togs with the aim of seeing what they would come up with in a limited time. Now with this opportunity and the general sharing attitude within the club there were common themes but no two sets of images shown were anyway near the same in detail. Views were shared and how-to’s extended. This is an important point. Whereas Adobe was, by and large, the most commonly used suite in the room, that did not engage everyone’s imagination the same way. The (unfortunate for some) truism that a no-expense-spared camera body and even more expensive lens doesn’t make a poorly conceptualised image a great one extends to the range of photo-editing suites. Proficiency in composition enables more to be got out of the tools in both cases. If you don’t know where you are going you will probably find yourself somewhere else is a much quoted aphorism in this blog. Visualisation is the first step in making a successful image, more often, than “Sheer dumb luck” (see the previous two blog posts) and imagination is the fuel for the engine of visualisation. The broader concept which we are progressing here, at the beginning of 2018, is the development of ideas. There are two basic positions which we can take, previously termed by yours truly as the Get-It-Right-In-The-Camera-ista and Ye-Acolyte-Of-Photoshop. More of the former than the latter myself, both points of view have currency, depending on where we are in the pursuit of an image. The more options we give ourselves in the first instance (Get-It-Right-In-The-Camera-ista) the more we are going to have to work with in the second (Ye-Acolyte-Of-Photoshop). Proficiency in both does not guaranty a good shot. If we cannot see the picture in the first place you are not going to get your best shot. If we don’t compose the elements in the frame it is unlikely to be very appealing. Repetition is a very good teacher, but with the important caveat that we pay attention to what we are doing differently this time – madness lying in doing the same thing over and over again expecting a different result. And for that we need to know what we are working towards and being open to new opportunities as they present themselves. Setting ourselves a project is an excellent development tool. Initially setting a photographic project needs a brake on the ambition. Make it small, give it a defined beginning and end and give yourself the time to complete it. A two, three or seven day project is a good start if this is all new to you. Take one subject and give ourselves a three to seven days to shoot as many variations of the theme as we can manage. Inside or out. Table top is a really good place to start, the important thing is that we think and think critically about the images we are taking and explore variations. There are books that do some of the work for you by giving tasks, some easier than others, the idea being we go out and shoot the assignment given to us and print and mount the best one in the book. We can go more DIY and use photocorners or some other mount and a reasonable size note book, something we can write our ideas and reflections on. There are plenty of lists out there for projects we can work through. The thing is not how good is it, but how do I change this for another story? Practical measurements can be taken from the Exif data but the key is much more likely to be in re-ordering the elements in the frame or making the light fall a different way. What quickly becomes evident is that having a clear end in mind is a good place to start. The journey is where the learning takes place. An essential, when doing this sort of thing over time, is to take notes. The artist’s sketchbook is a centuries old instrument that is a fantastic development tool. It’s for photographers too. The contact sheet, not only a film phenomenon, also has great value but as an extension to a sketchbook rather than a substitute. So why go to such lengths when we can go back through our photographs, especially those of places we have visited frequently? Well, I am not a very prolific photographer and the hard drive on my lap top contains 49,000 image files, all backed up on an external drive since you ask, with about 10% of those on Flickr in albums. The Flickr account makes it quite easy to go through similarly themed images and I do, occasionally, revisit some of the images on there and re-edit as an experiment, especially the ones from when I was getting back into photography about 5 years ago. Even so I keep a notebook for the odd thought that occurs or note on a method and writing this blog helps put context around what we do each week at club. The lesson from that is volume needs structure if it’s going to be useful. Too much choice is as grievous as too little. Then there is the reworking of the angles as we looked at when talking about Moving and Zooming in mid-January. Point of view is very important. A picture of a cat or a dog at their level (i.e. ground level) is very different than one taken looking down which reduces the power of the subject in the frame (the opposite is true of looking up, which is why so many Chief Executive pictures are taken from a lower angle and tell us a lot about the person being photographed). Reworking the angles of the light falling on the subject is a key way to affect the mood of a picture. Basically if we want to improve there are plenty things put there that we can do for ourselves, or we can share with others. Feedback is the breakfast of champions, according to Ken Blanchard, a management consultant rather than a photographer, but nonetheless we have first to create something to reflect and feedback on. Blog has been on a bit of a hiatus through other commitments but hopefully is back to being regular now. Our last session was the club Christmas party and a good time and a few quid raised for club coffers means that it was a success. A record was probably set for unflattering-photographs-of-club-members-whilst-sober but it was all in a good cause. Our thanks to Myk for running a very enjoyable evening. The programme in the new year is full of promise too, underpinning the aim of the club to be one where we learn together rather than one where blokes (it always is blokes) stand around, sucking the air through clenched teeth, fiddling with the string in their cardigan pockets whilst moaning about things not being as they used to be in the good old days. Like any skill we learn as much, arguably more, by not getting it quite right and keeping a balanced and critical eye. Use the judges’ opinions and try them out. Critique the result for yourself and compare it to your original. Use the clubs internal online presence (sorry members only) to try out others opinions. Use a buddy group, use external sites that offer critiques (thick skin sometimes required). There are lots of options. Try something new. Christmas is rapidly becoming the one time in the year many photographers decide to try out bokeh. Everything to do with the Christmas Tree lights. Bokeh is an example of making the most out of something you can’t change. In this case, the laws of physics, branch optics. If you look at the world through your camera phone, most of it is in focus most of the time, even though the lens aperture is usually pretty wide. Think of the situations cameras are used in phones for the most part and keeping things still enough not to blur means a wide aperture is a good idea to keep shutter speeds up. This is because of the depth of field relative to the size of the sensor you are using for capture. Basically F2 on your camera phone is roughly F11 on a full frame (35mm) sensor in terms of depth of field and camera phones use wide angle lenses (compare further). Note that is not an expression of the amount of light transmitted, only the area we find acceptably sharp. It also means, practically, that, mostly, bokeh effects on camera phones are software rather than optically driven. This is by the by for most users. You can, at least in theory, construct bokeh on any lens (tougher on a fish eye, but possible). The term bokeh is Japanese and an art term for the aesthetic qualities of out of focus light. It can also, given the right context mean senility or mental fuzziness, apparently, but that too is by the by. The keys to successfully taking a bokeh photograph are pretty straight forward. Paying attention to the basics of composition is as important as always. The effect may be out of focus but the subject must be in focus. Maybe obvious, maybe not, but essential nonetheless. Get as close to your subject as possible, framing is important and only having one subject is as important as ever it is. The largest aperture on your chosen lens is also a given if you want to maximise the effect. Prime lenses are probably better than zooms as they tend to have larger maximum apertures. F2 is more convenient for this than F3.5 which is better than f5.6 in that the depth of field is less for any given sensor size the wider the aperture set at a fixed focal length. But as with everything kit wise the one you’ve got is the best for the job. The other key is the separation between background and subject (and, of course, having some light in the background!). The larger this gap is the larger the bokeh effect will be. Of course the Christmas tree isn’t likely to have a lot of room behind, nonetheless the effect is still obtainable, though colour balance can be tricky. If you are at macro distances then the effect on the background can still be striking, though of course through a more restricted field of view. That includes the use of lenses and extension tubes, just bear in mind depth of field is extremely shallow. The shape of the bokeh is determined by the number of leaves that go up to making the iris. Cheaper lenses tend towards having five or six blades to the iris, more expensive lenses 9 or more (and in between). The more blades the more circular the bokeh appears. The other factor is the placement of the blades, straight or rounded making for hard edged or circular smooth points. You pays your money and you takes your choice. And that is pretty much all there is to it. It can be done indoors and out. It can be done in different light levels. It’s a simple technique that makes the most of a physical necessity. It can be one point or many depending on light source(s). Straight forward and quite striking. Try it. Someone says reflections and we think of mirrors and shiny surfaces where the scene is played back to us in reverse but in the same perspective, so what is reflected in the surface appears as far behind it as the actual object being reflected is in front of it. We see them all the time, sometimes marvel at them, sometimes curse them most often accept them as part of the environment. Ask a physicist and they might say something like a “Reflection is the change in direction of a wavefront at an interface between two different media so that the wavefront returns into the medium from which it originated” (Wikipedia) and the rest of us nod and try to move on, but not quick enough and we, like the Wedding Guest in the “Rime of the Ancient Mariner” are snared. They continue: “The law of reflection says that for specular reflection the angle at which the wave is incident on the surface equals the angle at which it is reflected. Mirrors exhibit specular reflection” (ibid). For which we are grateful, we explain, but it’s our turn to shampoo the goldfish and, unfortunately, we have to move on. All very true, well the physics bit anyway, I am sure and actually kind of fascinating, but we don’t really need to know the physics to observe and, as photographers, capture. Although lens manufacturers spend millions of pounds and tens of thousands of hours in designing glass that transmits without specular distortions, we, nonetheless, as our latest meeting proved, will insist on putting the specularities back in. Bokeh anyone? It can be true, depending upon the situation and the desired outcome, that we spend a lot of time and energy in controlling reflections, often using reflectors, gels, scrims, flags and alike but we will come back to those in another post in more detail. There were some very interesting images made by members using a polarising filter. Polarization is an effect on light waves that reduce its passage to a single plane, “A flat surface on which a straight line joining any two points on it would wholly lie”, rather than a direct flight to Marbella. Polarisers don’t work on metallic surfaces because of the angle of scatter metal produces (cars and so on also have layers of paint which are also “dialectric“), lacking “Brewster” angle. This is one of those things you either already know or don’t really care about because you don’t need to know. Essentially as photographers we know that polarisers reduce reflections and darken skies at the right angle, but not from metal surfaces. The plastic rulers, backlit, showed rainbows not seen in normal light, the iridescent rainbow patterns appearing like stress marks, shown using lens-mounted polarising filters were an interesting diversion from how we usually think of in these sort of filters. And there were plenty of others using foils and glass and water and mirrors and metals all providing interesting and off beat opportunities. That, though is to miss a rather large point. Reflections are to be found all over the natural and built environments, especially the latter and can be used to enhance an image by providing balance or foreground interest or as the focal point. It can also be used to limit the dynamic range within a frame by moving the histogram to the right – basically, by removing significant areas of shadow. Of course this is a function of the lightest and darkest points in the frame which in itself is a function of what we choose to include in our frame. Not always possible, of course. But we were working in doors and that generally means that we have greater control over the lighting. A light tent was one of the pieces of equipment brought in. Light tents act, when the light is kept outside of the tent, to soften the light on the subject which is also isolated from all background distractions apart from those you chose to include. Most often associated with product photography, though that should probably read small product photography, they are a cheap way of getting in some practice of shooting a subject under controlled conditions. You can, of course, spend as much money as you want on it, but the basics remain the same. It is particularly good at practising with light modifiers, especially with flags and reflectors, I find, not least because you are not struggling with giant soft boxes and the like, yet still are dealing with the same problems. It is a matter of scale. Whether you need artificial or additional lighting is largely a function of preference as if there is sufficient daylight then the effect is pretty much the same, you still can employ your (mini) flags and reflectors to direct a greatly suffused light. Lack of artificial lighting just limits the time of day and you can easily make your own light tent from a card board box and some grease proof paper, if needs be. There are dozens of effects you can conjure up with a little bit of time and patience and stuff you can find around the house, the point is, though they definitely have their uses, you don’t need a vast and remote lake reflecting a glorious mountain range that it took you and your dedicated team of Sherpa’s three weeks to trek to to make use of reflections. They are pretty much everywhere, especially in the built environment, and if not, you can make them. Quiz Nights. You can’t beat them so we joined ‘em. Thanks to Myk Garton for putting the evening together, I know from first hand experience just how much effort goes into making it look effortless. And of course all participants showed themselves masters of their hobby. This week on the blog we will wrap up two of the three remaining questions from the Week 2 Q by looking at: What is front curtain, rear curtain and slow flash? And what is Back button focus? This week has also been the big European photographic trade show, Photokina, held in Germany, one year I will have sufficient time and money to go ….. Still, daydreaming aside, what is front curtain, rear curtain and slow synch flash? Flash, aka strobes, aka those lighty things, is an area that is both technical and often ignored by the amateur. Yet it is one of the most effective accessories we can purchase. After all most of us have one built into our cameras, even if it does get overlooked most of the time. There is more to this than we will look at here, indeed we will visit this in a future blog, but for now we will explore the question that was put concerning these three often found menu options. For this specific question we do not have to differentiate between off camera flash (or strobes if you prefer) and on camera (that is pop-up or otherwise built in). The reason behind this is that this is a specific question of the firing order of the flash in relation to the curtain or shutter. Mostly this is done off the position of what is known as the front curtain. The majority of cameras have a two curtain (shutter) set up. This enables faster shutter speeds, the flash synch speed of your camera is actually around about the fastest speed that the whole of the sensor is exposed. Otherwise it is exposed through a slit formed by the front and the rear shutter curtains moving across the sensor plane at a fixed distance apart. The faster the shutter speed the closer the gap. If you expose using a strobe/flash unit above the flash synchronisation speed you get a dark band of varying width according to the shutter speed as the duration of a flash is extremely short. Because the lens projects things upside down onto the sensor and the shutters move from top to bottom this band will appear from the bottom upwards. Not so much of a problem if you only need light at the top of the frame, but not actually something that is easy to fine control both because of the position of the shutter at any given time and how much darker the rest of the frame is. So why have a front curtain flash and a rear curtain flash? It’s to do with the motion blur in the frame and where the pulse of light freezes that in time. The least subtle explanation, nonetheless one that actually holds true, is that you use front shutter curtain to freeze the action. You might use your maximum shutter synch speed (often automatically set but that depends upon make and model of your camera body) to give yourself the maximum chance of freezing the action. You use the rear shutter curtain and, usually, a lower shutter speed to freeze the foreground and retain some motion blur in the scene. And slow synch flash? Well that is an automatic camera mode that forces a slower shutter speed and synchronises the flash. You can get some very different looking results from the same scene using these variations. As ever, try it out for yourself. Yeah, that is what it is but what use is it? Well first off there is the fact that, whilst depressed, the AF button means that you hold whatever it is you have focused on. In the automatic modes focus shifts when you shift what you are looking at, which can be time consuming. In order to keep the focusing, for instance if you want to shift the main point of focus to the edge of the frame and blur the background. You might want to add to that you can use the continuous mode (AF-C or AF-Servo depending on your camera body manufacturer) of focusing on your camera when following action and use the AF button to freeze the most advantageous point (takes some practice but worth the effort with a high degree of movement in the frame). Or basically no more having to focus every time you let go of the shutter which takes time and can mean that you loose your shot. Annoying when it was already in focus the last time you half depressed the shutter. So now you know. Next meeting is Table Top photography, a practical so bring your cameras and tripods. Maybe your flashes too! 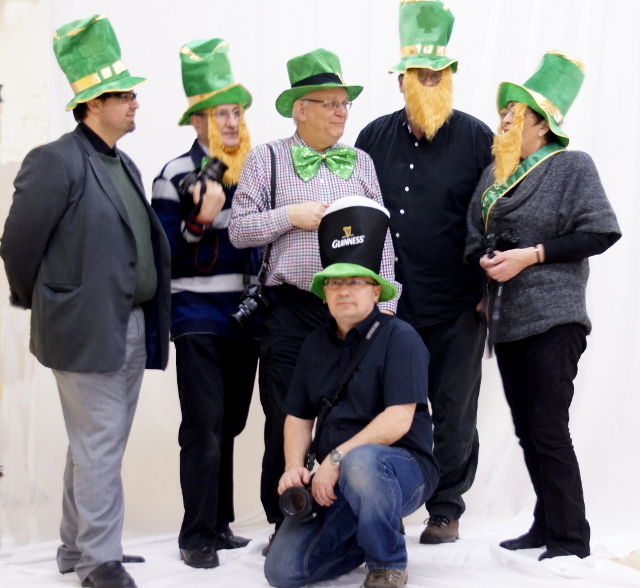 Slightly late for St Patrick, last Thursday had a distinctly emerald tinge to it, as the club celebrated the Apostle of Ireland with a photographic evening. We were joined by local model Kelly Wolf Rogers and various club members were dressed in (at least) forty shades of green. There were balloons too. And cake. Thanks to everyone involved in getting this event together, it was a good humoured and very enjoyable one. We don’t set so much store against Saints days in the modern era (not least because, strictly speaking, it is a denominational affair) but they were and are a way of setting out the seasons. St Valentine’s day is where the bleakness of winter starts to be broken by wild primroses, crocuses and aubretia (those small, usually purple, flowers that grow in clumps I am reasonably informed, however, to me Hell is a Garden Centre so I would probably have accepted that it was a form of fungal infection just as readily). Saint David’s day is a bit early for our idea of spring but there is plenty going on. Paddy’s day and you may start to see the first of the bluebells in the far south west, but by St George’s day spring is resolutely marching north across the country at a steady walking pace. Warmer, if not entirely dry, weather entices the less hardy outdoors. We are not short, in other words, of photo opportunities provided by nature, from the very small to the grand vista. Let’s start with the very small. I am using the term close up rather than macro in deference to the technical definitions of such that hold macro to start at an image reproduction ratio of 1:1, that is life size. A third term you often come across is micro photography and they are pretty much interchangeable in any camera company marketing department. A few, if obvious, facts bare illuminating as our plot unfolds. Every lens has a minimum focusing distance. The longer the lens the, generally, further away from the camera that will be. Short focal length lenses focus closer. Depth of field is shallower/deeper the more telephoto/wide angle you go. Smaller than about f16, apertures start to soften out the image because of light diffraction. So, speaking in close up terms, there are ways of getting more out of your lenses than the manufacturer designed for and each have their pros and cons. You can also ally these with certain software tricks, such as focus stacking, so as to cheat more out of your equipment. Certainly this is an instance of where a tripod is an absolute necessity (at least until you can slowly zoom in video on 4k – 8mb per frame – , or Sony’s rumoured 8k DSLT – 33mb per frame) , but that doesn’t mean that you have to bring the outdoors indoors to achieve it. Neither do you have to go to extremes, these things can be found around the house, e.g. a pot plant, fruit, etc. but also “in situ” as it were. Why, essentially, do we need to do this when we are shooting close up? After all we usually only have space for one thing to be in focus, indeed, often to fit in the frame. The first problem that we usually have to contend with is depth of field. The D.o.F. on a 50mm lens set at f8, focusing on an object 25cms (10 inches) away is less than a centimetre (about 4/10ths of an inch in imperial) on a 1.5x crop sensor. It would be less on a full frame sensor. Autofocus may not cope, so be prepared to go to manual. Nature, it has been observed, is wild and inclusive, whereas art is about choice and exclusion. In the discussion, very broad as it was, on the last blog, on the section about wide angle lenses, it was stated that they are commonly associated with getting all the view in shot, whereas it is an invitation to get in close. To marry these two observations we need to think in terms of why what we have in the viewfinder is there and also to investigate other angles too. Don’t forget to press the shutter though. So what has this to do with close up photography? More than it would at first appear. In both instances a small detail in a larger context is the situation for our image’s story. By deciding we want a close up of that insect, that petal, those leaves etc we are making very definite decisions about excluding other detail from this story. Coming back to the detail idea, what is obvious in close up photography, applies, just not necessarily as obviously, to landscapes, portraits and so on. We have been told by more than one judge at the competition rounds (next round at the next meeting, f.y.i.) that there is room in any frame for a single story. When we are using wide angle lenses to capture an image the edges of the view become more important than is the case with telephoto’s. The reason, of course is that there are more chances to cover more objects and those objects could be distracting to the eye. This is also something you can get in the close up, extraneous detail you overlook because you get target fixated. That target in close up photography is the in focus area. We end up concentrating so hard on that we miss what is glaringly obvious in post production. That detail we miss will almost certainly be a little off centre, (or centre of attention). The same happens with wide angle lenses, the wider the angle the more of a problem. Attention can be distracted quite unintentionally so you need to be aware more of what is on the outside of the frame. Lighting for close up outdoors is also less of an issue and a different set of problems. Whereas the “ideal” light for landscape falls within the Golden Hour, and some landscapers won’t photograph in anything else, a lot of opportunities exist throughout the day – and you don’t always have the opportunity of going back at a more fortuitous hour (and can’t control the weather if you do). Judicious use of reflectors or auxiliary lights, flashes etc (though not the one on the camera as it will fall within the shadow of the lens and will unlikely be reducible to useful strength if it doesn’t) can certainly help in ways that are inconceivable for the bigger picture. If you want to wait for the golden hour, the details in the landscape, even down to the very small ones still offer opportunities.